By properly maintaining and caring for your wooden flooring, you can ensure it looks as wonderful as day it was installed. By properly maintaining and caring for your wooden flooring, you can ensure it looks as wonderful as and indeed better than the day it was installed. We supply Treatex, Bona and also multipurpose cleaning kits which FPS recommends for use with all its new floors. Products that aren’t specifically designed for the care of wooden floors should never be used; they can lead to dull floors which become scratched more easily or cause a build up on the floor surface which can become slippery. Wet mopping is not recommended. Excessive water on a regular basis can warp and stain floors and strip the finish from the surface, increasing the maintenance required. Dragging furniture and heavy items on the floor will lead to dents and deep scratches in the surface of the floor. Using felt pads and glides can help prevent this and FPS advises fitting them to all furniture. After installation it can take several days to for dust and particles to settle. During this period the floor should be swept or vacuumed regularly. Do not mop the floor with just water; always use a product recommended for your specific finish, to help protect the floor. 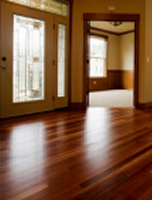 The first step in maintaining wooden flooring is prevention of dirt. Placing rugs and runners, in high traffic areas and recessed door mats in entrance ways prevents any dirt, sand, or grit that can be tracked in on shoes. Wooden floors should be vacuumed and swept on a regular basis. When your floor gets dirty wash using Treatex® Floor Care, which is designed to clean and maintain floors finished with Hardwax Oil. For normal soiling dilute 25-50 ml of Treatex® Floor Care in 5 litres of water. Mop the surface with this solution ensuring that the mop is only damp and never wet. Lightly mist a 10×15 cm area of your floor or spray the cleaning pad directly with Bona Care Floor Cleaner. Use a slightly dampened, well wrung-out Bona Care Cleaning Pad, and thoroughly clean the floor surface with your Bona Care Mop. Finish one area before moving on to the next.